Sea of Thieves has a new update featuring some long-awaited improvements, most of which focus on combat balance. 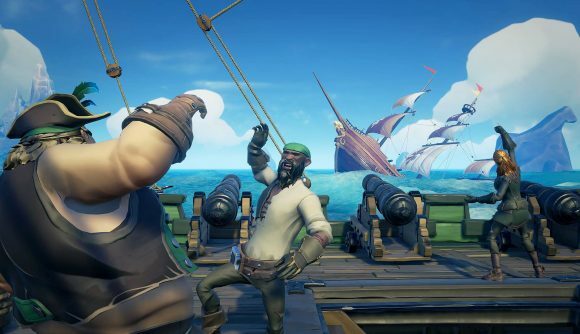 Rare’s been teasing two of those changes for a long time – a nerf for double guns and protections against stream sniping – but there’s plenty more, along with some new feature teases that will seem to set the stage for the upcoming Sea of Thieves mega-update. The double gun exploit saw players fill their two weapon slots with multiple firearms and take advantage of quick swaps to get fast kills. Rare didn’t like that it was possible, so now all weapons have new wield animations to introduce a brief delay before you can actually fire. In another animation change, reloads are a bit faster now – you can fire once the hammer is pulled rather than than when the animation is completely finished. Sniper rifles are getting their damage reduced from 80 to 70, and they’re less accurate when you’re firing from the hip. Those nerfs are balanced somewhat by other, wider gun changes – bullets from snipers and blunderbusses now move faster, and there’s no longer any damage falloff from firing at range. Additionally, you can now toggle whether you see nameplates for players on other crews, which should help to protect against stream sniping. There’s plenty more in the full patch notes, including some hints at new features to come. A new fort is under construction, and you’ll find that there are new kitchen implements installed on player ships – which seems to suggest that cooking is coming soon. You’ve probably heard by now, but Sea of Thieves is also running a Friends Play Free promotion from now until February 13. Every existing Sea of Thieves player is getting three codes that’ll each let somebody play free for the week. So if you’re looking to set sail, you can go beg your friends for an entry pass.